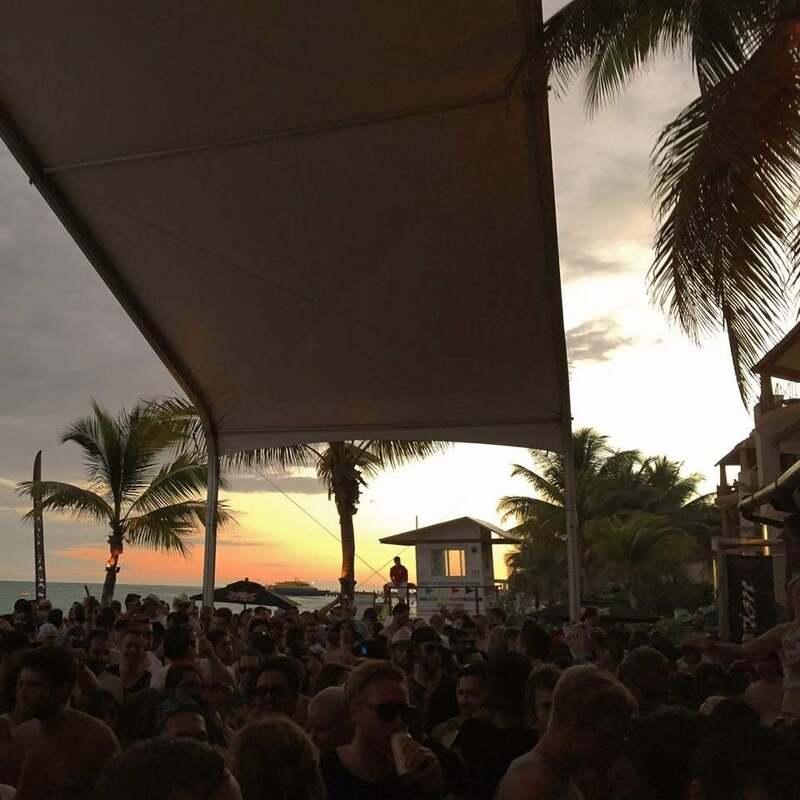 Part 2 of our epic BPM festival report continues right from where we left off in the first part. Peter: Monday at Fusion was Maeve Rave time. Mark Flynn aka The Drifter opened what would become one of the best events of the festival. All DJ’s matched harmoniously with each other and were aware of time, place and corresponding atmosphere when playing. It all started, like a beach party should, with relaxed beats, then Baikal took it up a notch and by the time Tennis handed over to Mano Le Tough the intensity was far up and still rising. Icing on the cake was the b2b2b2b2b session with all four DJ’s behind the decks playing the best they had brought to Mexico. The crowd enjoyed it just as much as the artists did, a real treat for the fans of the Maeve sound. The numerous positive comments and amazing pictures posted on the event wall afterwards can’t be wrong; Maeve Rave was quite something. Lex: Later that night it was time for the Smoke N’ Mirrors party at La Santanera, a venue right in the city center with 3 floors. The first floor of the space serves as a bar, the middle floor as the main room and the topfloor as rooftop, each having their own magical vibe. I myself was sick all day before and slept for about 17 hours that day, to try to recover and make it to the Smoke ‘N Mirrors in one piece, as I was playing at 2AM on the first floor as KIMOU. When we got there and I started playing, I felt a lot better right away. Like they say, music is the best drug. Besides the music also the mezcal helped in the recovery process. People seemed to really enjoy themselves and the vibe was great. We caught a glimpse of Justin Martin, Climbers and Maxxi Soundsystem, who were all rocking it, but as I was playing from 2 to 5am we missed some other amazing artists performing that night. Peter: The next day it was time to chill a bit by our pool and swim in the ocean at one of the many beautiful beaches. We felt a bit sorry for all the people that were not here and going to work in the cold, but to be honest that also felt kind of good. After a good meal it was time to see the Diynamic crew at Blue Parrot for the Tuesday night event. Magdalena and Thyladomid did a good job warming up for the main acts of the night, starting with Adriatique. The Swiss duo played what seemed a reverse set with a ‘techy’ first hour and a more melodic second. We are big fans of the boys, but we though they could have played a better set. This was soon forgotten, because H.O.S.H. followed with an excellent set of funky but firm deep house that perfectly built up to what everybody was waiting for. The big man himself hardly ever disappoints and lived up to the expectations once again. Another great set that perfectly balanced between the various styles in Solomun‘s music collection. By the time he pulled the plug, the sun was up for a while and the crowd tired but happy. Maybe the best thing about the BPM Festival is that after a heavy night, there’s always a beach party waiting to help you get rid of a hangover in a matter of minutes. Not the usual Sunday afternoon crawling from your bed to the couch and back, while outside the rain is pouring. Just the sun, a cool breeze, fresh taco’s and good music. This Wednesday wasn’t different. At the Endless showcase at Fusion Jon Charnis was doing his best to make the sun shine even brighter than it did already. After him special guest Marcus Worgull went a bit deeper, as did The Drifter, but still everything remained rather relaxed. Maybe a bit too relaxed, but that could also have something to do with the number of visitors. Actually it was a shame that with a line-up like this the beach club was not completely full. Martin Buttrich was up next and played a great set that was one or two steps harder than the rest. Everyone who was there had a great time and that’s a compliment to the artists.